The world’s spinning. Not because of what you had to drink last night, but because someone just blindfolded you and actually spun you around in circles. That’s the beginning of the ancient dance that leads to the bludgeoning of the piñata, a birthday party and holiday staple that’s most closely connected to the Mexican culture—but likely finds its roots in the Far East. 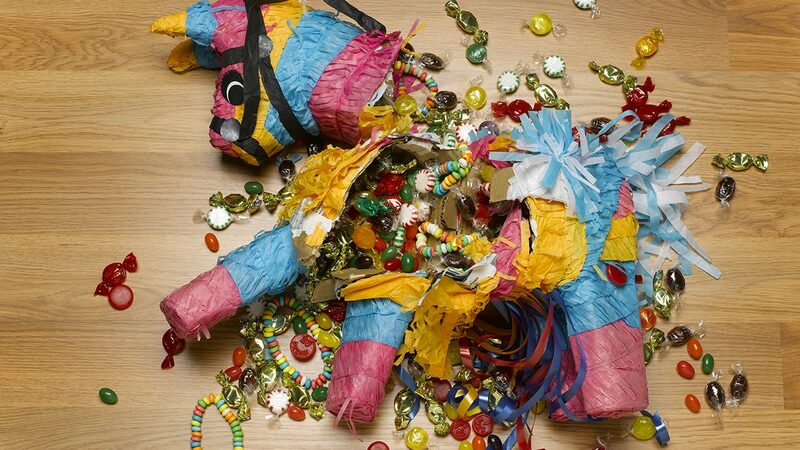 Given that piñatas are typically made out of papier-mâché, the going theory is that they originated in China (the Chinese invented paper, by the way). However, the Chinese version of the piñata was made for the new year or during springtime, were made to look like farm animals, and filled with seeds. (Sorry, no mini-Snickers.) The object was then burned, and the ashes kept around as a good luck charm. These days, the piñata’s not only a popular fruit- or candy-filled birthday party ice-breaker, but is also enjoyed during the Christmas holiday in Mexico. It’s also been used recently to make a statement—a political one. Sales of the Donald Trump piñata seem to be on the rise, at least according to the Santa Fe New Mexican. To get an inside scoop of how piñatas are made and one family’s long history in the piñata business, watch the dizzying GoPro video below.